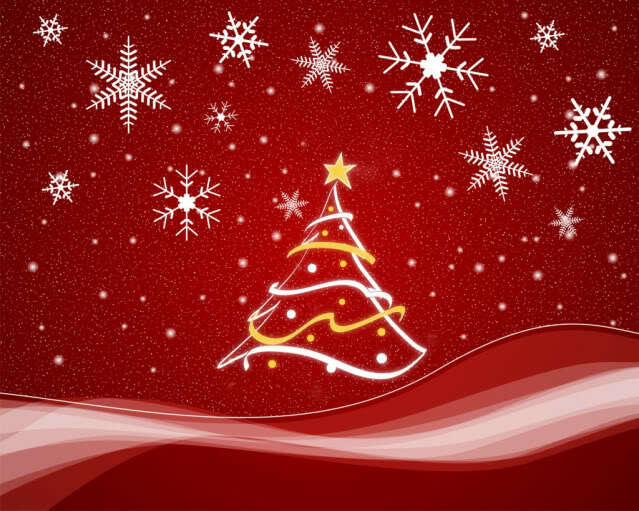 Wish you all a very MERRY CHRISTMAS!!!! The DPs are from Echo Park( old collection). I used spellbinders snowflakes dies, Making Memories brad and some rhinestone stickers for this card. Creative Craft Challenges: Non -Traditional Christmas. Our Daily Bread Designs Challenge: Snow/Snowflake. Today we've a FUN Challenge combo. YEP! Two of my fav. 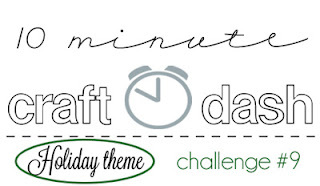 challenges together..
CAS-ual Fidays Challenge joins 10 Minute Craft Dash this week!!! CFC83: Create a CAS holiday card in less than 10 minutes! Winner will receive a $20 gift certificate to the store! 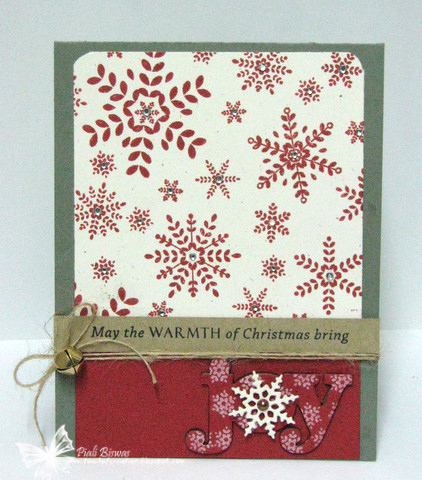 I like to use punches instead of dies for quick cards...the sentiment from CFS-Snowflake Greetings set fits perfectly on a 1 1/2" punched circle . The DPs are from Studio Calico- Wonderland collection. ... I love this big Snowflake punch from Marvy. This joint challenge will run for two weeks...so there is plenty of time to play , this will be awesome for some last minute Holiday too!! Today I've Christmas card to share with you all!! Its an Unusual one as there is no stamping on it.. I used Bazzill Card shoppe -Marshmallow cardstock , Clear Cuts from Lil' Yellow Bicycle and Red border sticker from Echo park for this card. This is one my fave holiday creation!! Sunny Challenges : Winter holidays. Its a new challenge ...my DD Anushka runs this challenge!! Simon Says Stamp: Merry Christmas. Crafting for all Seasons: Green ,Red Glitter/Sparkle. 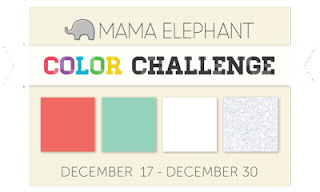 Did you all see that MAMA ELEPHANT Stamps started a new color challenge??? They have a lovely color combo with GLITTER for us to create. I love ME stamps...they're Fab!! Unfortunately I don't own any of them yet :( This issue of missing International packages has gone too far , I'm not ordering anything lately as I never get the stamps in my mailbox...I'll wait till someone from US comes to visit. 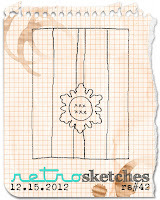 Anyway , you can find a super cute FREE digi over at Mama Elephant blog to create with. Just changed it a lil' using Photoshop. The Red Washi tape is My Mind's Eye. I created the glitter band with 1/4" double sided adhesive tape and silver glitter. Mama Elephant color challenge: #1 Color combo. Paper Pretties Monday Challenge: Christmas. The Cutie Pie Challenge : Cute Christmas. I've few more CAS holiday cards to share. CAS holiday card using some Echo Park paper and the lovely sentiment from THIS stamp set. Added a row red rhinestones for festive sparkle. This stamp set is AWESOME!! 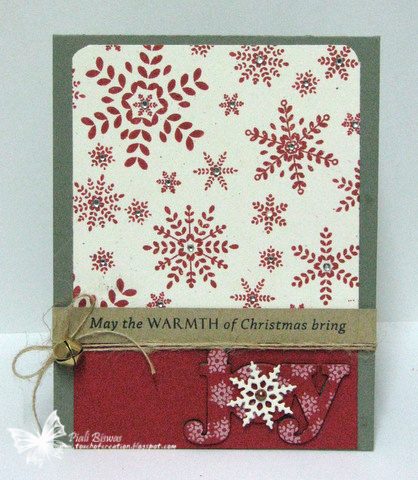 You can make several of the cards with different simple or complicated designs. 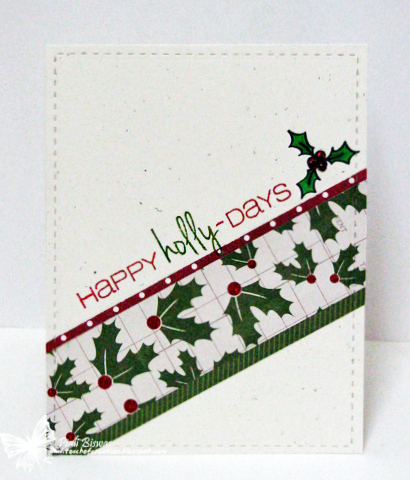 I used Sizzix EF for this card...perfect match for the holly image. Created a faux epoxy button ... just stamped the image on white cardstock, colored it and applied lots of Glossy Accents and sprinkled a lil' glitter on it. Stamp Your Life: Anything Goes. Ready Teddy Go : CAS. Come and Get It Challenges : Anything Christmas. Make sure to check CFS Blog for daily inspirations. 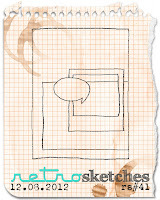 I'm back with a quick post for a last minute hour entry of fab sketch challenge....Retro sketches! Its been a while since last played along with some sketch challenge. Mixed few fun stamps together.... 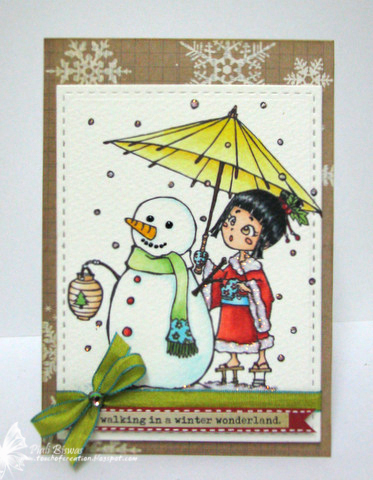 Sentiment from Hero Arts/Studio Calico set and the cute Snowman is from Paper Smooches stamp set. 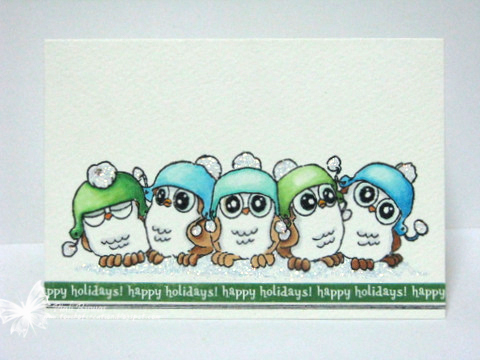 The lovely DPs are from Doodlebug designs. The cute lil' frame die is from Lil' Inker Designs. Also added just few embellies...baker's twine, button and rhinestone with lots of Diamond stickles for snow. ABC Challenges: Let it snow. CFC82: Create a Clean And Simple project that features scoring.. 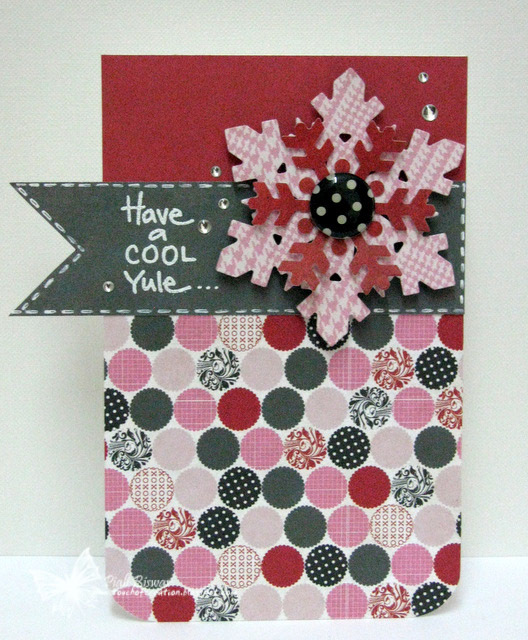 The sentiment is from the CAS-ual Fridays Stamp-Snowflake Greetings set. 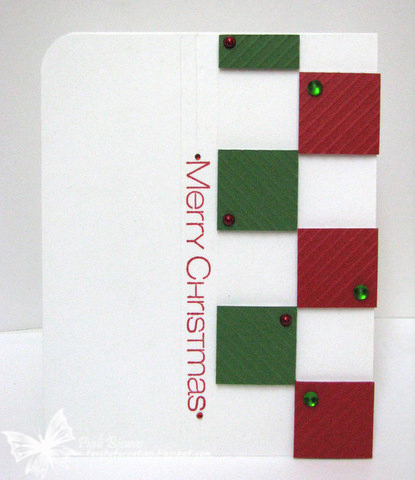 A super simple card with few blings for holiday sparkle!! Crafting for all Seasons: Red, Green and Sparkle. Anything Goes Challenge : Traditional colours. Today its 12.12.12.....super special day!! 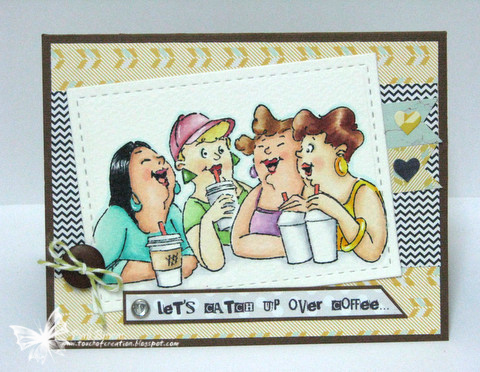 COFFEE, FRIENDS, PARTIES, COPICS and THIS lovely stamp from Art Impressions. Its an invite for Girlfriend's Meet over at our fav. coffee shop. I used Fancy Pants papers and Art Impressions- Girlfriend Blend stamp. I just created the sentiment with MS Word. ...My fav. Copics, Lil' Inker Designs' Stitched Mat and Art Impressions stamp. Artistic Inspirations : Anything Goes. Stamps & Fun = Creativity: No Christmas Cards. Here is the last SCRS challenge for the year 2012!!! The theme is one of my fav. things...SNOW, miss it a lot here in INDIA!! This is one of my favorite Winter images !!! 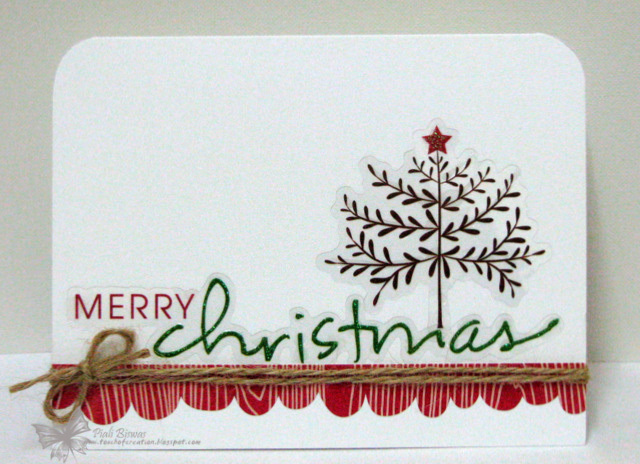 I used papers and sentiment sticker from Simple Stories -Handmade Holidays Collection. Love this MayArts ribbon from Ribbon Carousel. The Ribbon Girls: Christmas projects. 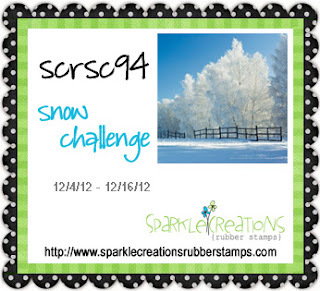 To play along in Snow challenge, upload a photo of your project and provide a direct link in the linky widget at the bottom of this SCRS post. Deadline for challenge #94 is Sunday, December 16th @ 9 PM PST. 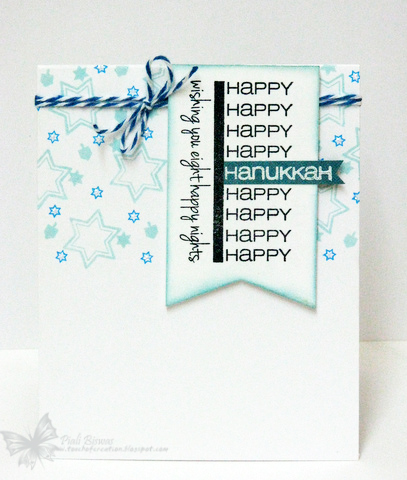 We're sharing some Hanukkah inspiration over at CASual Fridays Stamp Blog. For those who celebrate..Happy 3rd night of Hanukkah!!! Here is my CAS card for the celebration. Love the 8 Happy Nights set.. there are not many stamp sets for Hanukkah that I've seen, this one is Awesome !! Card Crafter's Circle: December celebrations. Jellypark Challenges: Stars are brightly shinning. Moving Along With The Times: CAS. Make sure to stop by CFS blog to check out the Gorgeous creations by DT. I have card for this month's CLOUD9 Bloghop. Actually I made this card on 9th...just had to adhere the rhinestones, I usually adhere the flatback gems with Glossy Accents. My craft table is a huge mess now...and I couldn't find the bottle of glossy accents. Finally today I found it and now my card is complete. Folk Art Flurries is my fav. snowflake set....simply gorgeous images!! The sentiment is from Pretty Patches Christmas set. I also used JOY from the coordinating die set to diecut the red cardstock part and stamped snowflakes on it and adhered it with pop dots. Also added lots of Rhinestones , Jute Twine , a bell and one brown pearl. 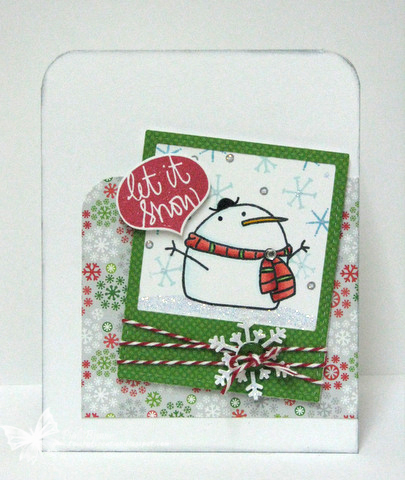 Stampin' For The Weekend : Let it Snow. 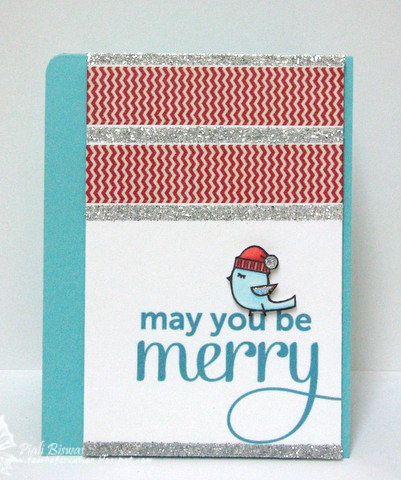 Today I have a super simple holiday card using my recent fav. stamp. I love this super cute FIVE WHOOTS stamp from Art Impressions. The sentiment is a sticker from Echo Park. Crazy 4 Challenges: Favorite Stamp. 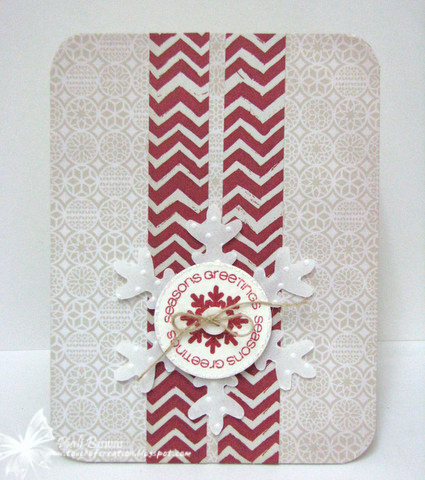 Rogue Redhead Designs: One layer Winter Holiday card. Less Is More : In a Row. So Artful Challenge: Birdlife, Winter holidays.